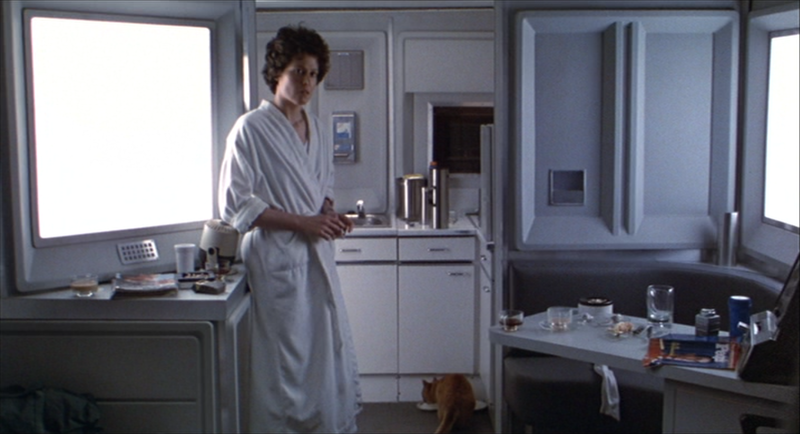 The upholstery on the Nostromo is really nice. What's it made of? Is that just vacuformed plastic? What I really don't get is how the seams don't show. Maybe there's weatherstripping involved? Cantilevered platforms are out of our budget range. But the light and the sort of surgery/dentist tools above Kane are very nice aren't they? Making this room circular must have taken quite an effort. This is a CG model from the Interwebs. It's much too detailed to be made as vacuformed panels. The alien medical bay from another angle. Are those speakers on the wall above the lighting instrument in the photograph? Ash's station here is not as super-duper expensive as (say) the bridge. But I like the sort of s-shape of the vertical pieces. What I fail to comprehend is how the seams work because it's like the whole thing is molded out of one piece. It's quite lovely actually. 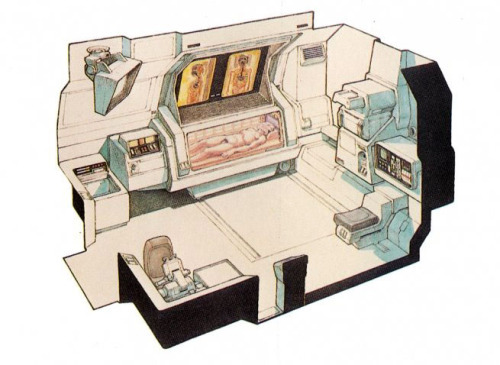 Here's the medical bay from a video-game of Alien. I tried simplifying the above CG image to see if it was something we could have vacuformed. It was prohibitively expensive. So I'm pretty sure this is Leeloo or... wait, no. The medical bay in Prometheus. I don't know. 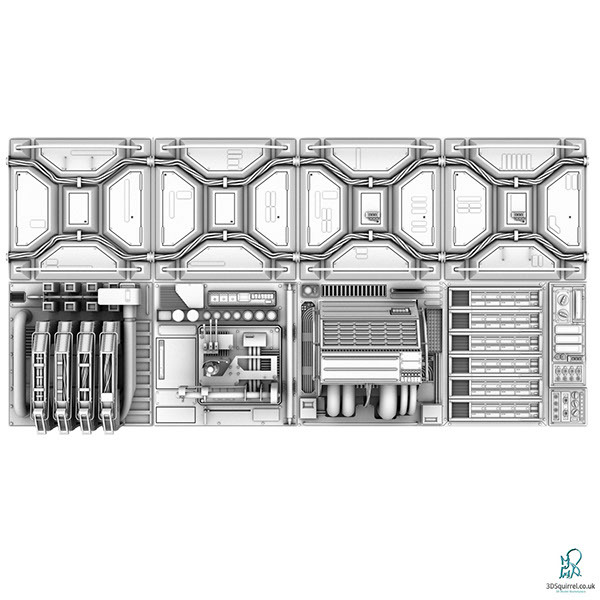 Production drawing for Alien maybe? The state actually gives you a pretty decent apartment when you come out of hypersleep. Maybe it's because you have a cat? I do love how inconvenient the corner thing Ripley is leaning against is. Whoops skipped down a post and didn't see they were separate. 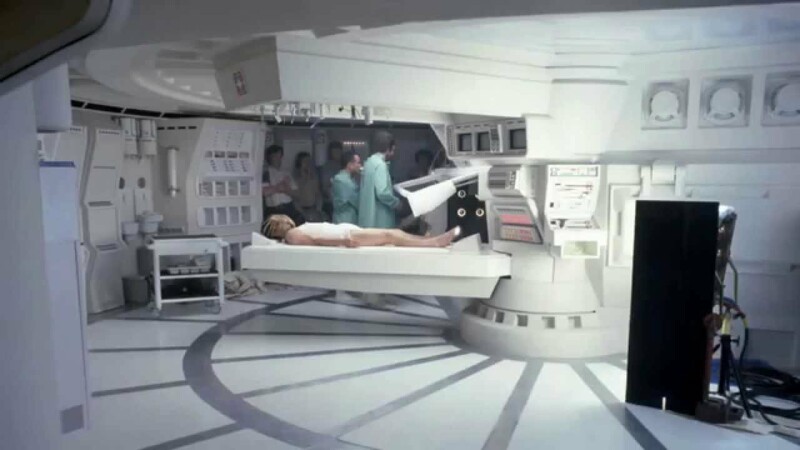 Here's the suggestion for the medical bay that is one post off. Alien medical bay, The seams were sanded and then painted, some of that is plywood and fiberglass as well and Bondo... lots of Bondo. As for sets, why build more then what the actors interact with and just CGI the fill in. Easier and even AE can take an OBJ mesh panel and insert it into the footage using 3D track and compositing. Why buy a bunch of FIREs that are not going to be touched. Why not just back light Chroma-Blue transparencies with tracking markers on locked or non-interactive panels and save a few quid and composite them in post? Oh. Fiberglass. Plywood and Bondo. Oh. But of course. Oh. I think I get it now. Bondo. Oh. That makes a whole lot of sense. Thanks! Yep I read way to many behind the scenes stuff. Star Wars, Alien, Blade Runner, Running Silent. All of them built the same way. Fires are cheaper? Actually your right, if you run three static non-interactive monitors and had to motion track and tag each one. Wow. Actually if your building a ship that doesn't have gravity or is patched technology, you can just run conduit and wire along the walls of MDF retain them with retaining clips and to hide seams run panels in an interlocking fashion like you did on that one set. I'm not going for a non-gravity look. It always looks bad unless you get in a vomit comet. 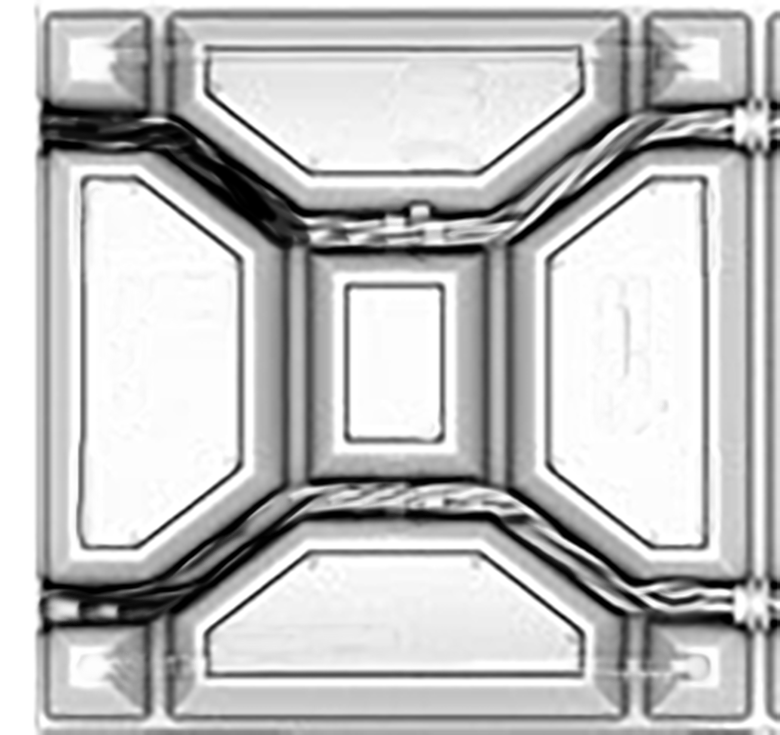 But an interesting thing about micro-gravity is that since no surface is the floor, every surface can be a work surface. I'm not doing any of that, but it's fascinating. I have way too much affection for Silent Running. It's not as good a movie as it should have been. But the design of it was simply beautiful. And Bruce Dern was great.